Though the idea of a corporate office is not the most pleasant, there are a few companies opposing the norm. There are a number of innovative workspaces across the globe that showcase playful office decor. This article highlights a few of these innovative workspaces. Google is known for creativity, innovation, and fun– the Mountain View headquarters epitomize this. There are slides, free all-you-can-eat cafeterias, and gyms that keep Googlers satisfied. 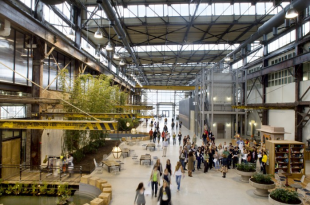 The environmentally friendly Googleplex boasts LEED-certified buildings. Google heavily emphasizes green practices and this can be seen by Google’s on-campus green initiatives and competitions, the bike-to-work program, and carbon neutral products. These green initiatives encourage employees to be more healthy, and mindful about the environment. Googlers can gather around this counter used both for lunches and meetings. The colorful carpet is a staple of Google’s bright and bold interior. Here is our co-founder Tom Turnbull soaking up the California sunshine at Google Headquarters. Vocus employees have what looks like an entire town to themselves. Vocus sells software to public relations companies to help them manage and monitor social media, email marketing, media interaction, and publishing. The office space includes cafés, a gym, and a spa that are designed to resemble neighborhoods all connected by the main street that winds through the building. This cosy neighborhood vibe gives a community feel to the building and facilitates interaction between employees. Co-workers can bond over a nice cup of coffee or a massage. The town center is the main gathering spot for Vocus employees used for lounging and for staff meetings. Red Bull London’s offices are located in the top three floors of a 19th century building. The roof-level extension boasts views of the West End. The open layout contains a bar, café, formal and informal meeting areas and an official boardroom. A slide provides a playful juxtaposition to the sophisticated floating staircase. The expansive space and playful decor are extravagant yet fun. The interior was designed to stimulate adrenaline and excitement mirroring Red Bull’s brand mantra. Urban Outfitters’ campus is home to Urban Outfitters, Free People, and Anthropologie. The campus brings together staff that were originally spread out across six different buildings with common areas including a cafeteria, library, gym, coffee shop and an expansive courtyard. The interior is bright, comfortable, and airy, just like the bohemian products sold. The design of the campus encompasses the brand’s culture as well the the rich history of the property. These beams are some of the traces left from the original building that provide a nice contrast to Urban Outfitter’s more hippie styles. Twitter, the microblogging social network with an environmental conscious. Although not LEED certified, Twitter’s office space repurposed a pre-existing building from 1937. The office fits in perfectly with Twitter’s ethos as the architects used natural or reused materials when possible. For example, the custom designed reception desk uses reclaimed wood from bowling alley lanes. The custom designed reception desk was created using reclaimed wood from bowling alley lanes. The humble desk epitomizes Twitter’s attempt to make the space sustainable with a sense of rustic elegance. Check out our pinterest board for inspiration! OpenSesame has a number of RedVector and Sustainability Education Series courses that will teach you about LEED certification and help you understand how to build a greener office. Check out these case studies for inspiration and suggestions. Do you have any other suggestions of how to create an innovative workspace?